Tag Archives for us bank. Since Costco rolled out Apple Pay to all their stores, I’ve used my US Bank Altitude Reserve card to earn 3X points every time I shop there. That’s because this card earns triple points on mobile payments and travel purchases. Each point is worth 1.5 cents toward travel (which you can redeem in real-time after they post! ), so that’s like getting a 4.5% return on every shopping trip (3 X 1.5). With prices already low, this is an easy way to save even more. Plus, you can stack coupons through Ibotta for cashback when you buy certain items. The card has a $400 annual fee, which easily pays for itself. The bigger issue is getting it in the first place – you need to have a “relationship” to even apply. But there’s an easy and free workaround if you want to open this card. Getting a 4.5% return on every shopping trip and mobile payment is awesome! Dear light of heaven, I love Costco. Whereas to some it can seem like a gigantic warehouse with narrow aisles stacked to the ceiling with pallets, to me it’s a veritable wonderland. Ummmm… Costco was the cheapest place to shop in New York City, honey. If I can find space in a tiny Brooklyn apartment to store extra items and save some cash, you can too. And that’s what it’s all about: saving cash. Admittedly, Costco isn’t always the best deal. Sometimes they try to pull one over on ya and slip in some regular-priced stuff. But I don’t blame ’em for trying to make profit. Because when the deals are good, hoooo boy are they stellar (find me a cheaper avocado and I’ll eat my hat, and bananas cheaper than Trader Joe’s). That’s what keeps me shopping at Costco year after year: THE DEALS. On top of already great prices, I’ve found ways to push them even further by making sure I always get a discount. 2% off, 5% back, even 10% rebates in some cases when I’m in the mood to plan a big shopping trip. 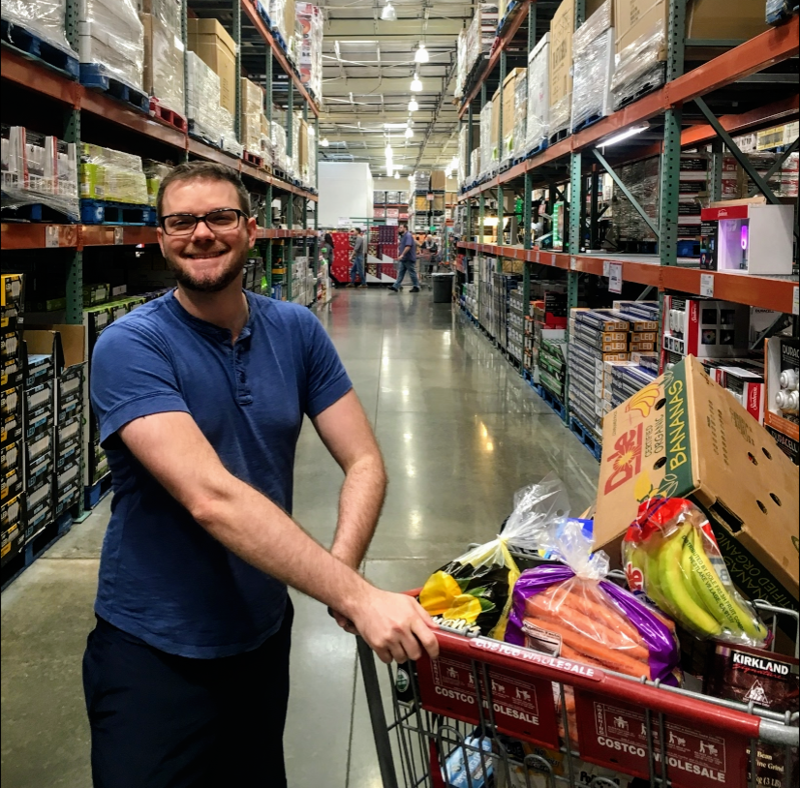 Here’s how I save every time I shop at Costco. Yay! A Huge 89-Point Jump for an Authorized User’s Credit Score! I shared how my brother’s credit score jumped 100+ points in a month after I added him to one of my credit cards. He had literally nothing on his credit report. Last month, I added an authorized user to a 5-year old (no annual fee!) credit card with a $13,000 credit limit. The statement closed on July 3rd. And on July 11th (a week later), we pulled his credit report. After adding my brother, and now with this new experience, I’m convinced how beneficial it can be to add authorized users to old cards with a high limit. And why it’s so important to have a couple of cards with NO annual fees in your wallet. Bottom of the Barrel: Have I Gotten All the Points & Miles Cards I Possibly Can? I wanna type out loud for a sec to assess which card offers I can still earn. Before I begin, I know there aren’t many. After all, I currently have about 30 cards and have rotated through many others since I started the points & miles game in 2012 (and heavily in 2013). So what’s left for me? I know it’s not much. Let’s take a deep dive. Which cards are left that I can even get? I’ve been riding Uber more lately because they make it so easy to stack multiple offers when you ride. And, I’m hopeful they’re slowly but surely turning things around. With Lyft, you can only earn 1X Delta miles – and 30 JetBlue points on airport trips. Which, meh. I’d rather earn cashback and Drop points, use travel credits, and get Uber credits for shopping around town. And many times you can stack these deals. You know I love a good stack! Well, it’s been nearly a year since a $6 charge from Dollar Shave Club on an Amex card plunged my credit score over 100 points. At the time, my credit score was 803 – the first time I’d ever gone over 800. I know it doesn’t intrinsically “matter,” because a score over 750 is as good as it gets. But I did have some pride at earning an above-800 score. So I was pretty horrified when one stupid error brought me down to ~700. All the work I’d done to build my credit was instantly erased. And, Amex was totally clueless, unhelpful, and actually prolonged the repair process by saying they’d corrected it on their end when in actuality they hadn’t done anything. I dragged my feet on filing a dispute with the 3 major credit bureaus because I knew it would be a slog – and it was. No sugar-coating that ish. But, as of last month, my score is now above 780 across the board! It’s not over 800 yet – I doubt that will happen any time soon – but I am happy my score is recovering. Here’s how it went down. On May 1st, I got the US Bank Altitude Reserve card – the first day it was available. I wrote how payments with Plastiq coded as travel with the Chase Sapphire Reserve card (lots of peeps on Reddit confirm this, too). So I was hoping that would be the case with the US Bank Altitude Reserve. Especially because the minimum spending requirement is $4,500 – that would’ve been a nice points haul at 3X. And the charges did code as travel. But my statement just closed and I only got 1X point per $1. This US Bank card and the Chase Sapphire Reserve are both Visa cards. So while it doesn’t work for the former, I’m hoping it will still earn 3X with the latter for a while longer. Should You Use a 0% APR Card to Pay Off Debt? NOTE: The card APRs in this post are current at the time of writing (July 28th, 2016). Be sure to check the offers for more details. So here’s an idea I’ve been tossing around. I’ve put off paying down this debt because there have been other opportunities to earn more: I bought a house, maxed out my IRA, started Airbnbs, and now I’m looking at buying a duplex in the DFW area. All of these things either appreciate or earn more than the interest I pay on my student loans. But I’ll be damned if carrying that balance doesn’t give me a red rump.